Looking for that edge in your game? 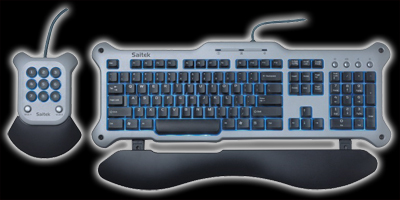 That's what the Gaming Keyboard from Saitek is specifically designed for. Blue LED backlighting with multiple intensity settings enable it to be used in a full range of lighting conditions. The black keycaps in a silver base offer sharp contrast in full light conditions. For comfort the detachable and adjustable palm supports allow you to relax while keeping that optimum position for relaxed keying. This keyboard is solid (2.9 lbs.) and designed to be stable on the desk or sit in your lap. The four large rubber feet hold it securely on any desk; so securely that you almost need to lift it when you reposition it. Never again will you worry about the keyboard slipping when you are under attack. With the extended stabilizing corners it is a little larger than most keyboards (19x9.5 inches) but makes up for it with rugged build and stability. The best part of this keyboard is the Programmable Command Pad which plugs into the main keyboard. The 9 programmable buttons combine with 2 option buttons to give you quick access to up to 27 customizable one-touch command functions. 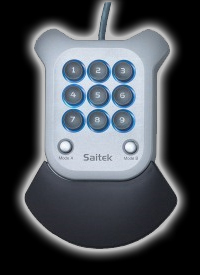 The Saitek Smart Technolgy programming enables you to preprogram one-touch actions as well as multiple key macros. When you time and speed of entry is important the Command Pad can make all the difference. Warranty: Discontinued, No warranty available.